So you’re about to start renovating? Or you’re thinking about a renovation in the next year or so? You may think that before you start you only need to get your design in place and hire a builder, but there’s actually a number of very early decisions you’re going to need to make if you want your renovation to be a (non-stressful) success. Most people don't realise how early some of these decisions need to be made and many make the mistake of leaving them until later in the renovation process only to find out they can't have what they want as it's too late to make it work. Today I'm going to share some of those early decisions you will need to start thinking about and the reasons why these are so important to sort out. Obviously it goes without saying that having a clear, concise and well thought out design is the most important early decision you’re going to need to have in place. Whether you’re hiring an architect or designer or creating plans yourself for a smaller renovation, make sure you've finalised your design before you do anything else. Mistakes and changes can be very costly once you've started work as these mean variations to builder contracts (which they tend to charge quite a bit for) plus the potential for things to be done twice if you make a mistake during the build and then want to change it. During the designing process also make sure you do more than just think about your floor plan and layout. You need to make sure you’ve consider all the other decisions like power, lighting, joinery designs, flooring, flow around furniture plus where you want to position things like drains (bathrooms), heating/cooling systems, light switches, power points and more. The more you've thought out in advance the less stressed you're going to be during your renovation and the less costly mistakes you’re going to make. If you’re drawing up plans yourself make sure these are extremely clear regarding your intentions. Never assume a builder or trade will know what you want from your designs unless you state it in writing on the drawings. Some details you may like to consider including in your plans includes layout of tiling, grout colours, joinery finish colours, flooring levels, locations and type of appliances (e.g. if your fridge will need both power and water, for example). The more information you can include the better, plus having things written down covers you if mistakes are made down the track as you’ll have something concrete to refer to. Make sure that before you start your renovation you’ve made and ideally selected all the big design pieces. Not only will having all these big design decisions selected mean that you’ve got an overall picture of what you're going to do in your renovation and how it is going to look and feel at the end, but selecting all of these in advance of starting your renovation will mean that you will know that these items are in stock (or that the lead time will work with your project timeline) PLUS you’ll know that the selections you make are on budget. Some early selections to make, and the reasons for making these early are listed below. Deciding what sort of flooring you’ll be having in each room is important early on for a number of reasons. The most important relates to flooring levels around your home (see more information about this below). But the other reason it is important is flooring is one of the big ticket items in your renovation and you’ll want to make sure that you budget for the flooring you want to have, plus make sure that the flooring you want will be in stock and ready at the time you need it. Some flooring, especially if imported from overseas, can take up to 12 weeks to come in stock so it’s important to make sure the finishes you want will come in on budget and will arrive on time. Oven - one or two? Stacked in the wall or under bench? Cooktop - what size do you want and do you want gas/induction/electric (as this will impact what is needed in terms of plumbing and electrical). Gas cooktops will need to be roughed in by plumber. Induction cooktops need their own circuit to run on as they use a lot of power, so all this needs consideration early on. Dishwasher - how many and where you would like this located plus whether you want this integrated in to your joinery or freestanding. Sink - including it’s preferred location. If you want a sink in your island bench, for example, this will have early implications for your plumbing. Plus whether you want a single or double bowl sink. Insinkerator - will need power to be roughed in for this. Make sure the sink you choose is compatible with insinkerators. Zip/Filtered water tap - enough space has to be allowed in joinery for these taps as they have huge amounts of equipment that live under the bench. You may also like to think about whether you want any of these other luxury items - e.g. coffee machine, warming drawer, wine fridge and any special type of bin or sorting bins. In the laundry you’ll want to select your washing machine and dryer as whether these are top or front loading (and their size) dramatically impacts joinery designs, plus some dryers need to be plumbed so this will be a consideration. You may also like to think about whether or not you want pull out ironing boards, laundry sorting drawers, storage for particular types of vacuums - e.g. power for charging a Dyson inside a cupboard - storage for pet food or storage for any other items that are particular to you and your circumstances (e.g. sports equipment). BBQ - especially if you want this built in outside. As you can see from above, joinery designs will be quite difficult to finalise until all your appliance and functionality requirements are known. But once these are known it’s important to bed down your joinery designs early on as well. The main reason for this is related to budget as joinery is one of the biggest line items in most renovation budgets. As a result you’ll want to make sure your joinery has been designed and quoted as part of the building contract as this will give you a chance, before the build starts, to make any amendments to joinery finishes or bench top finishes if you need to. You’ll also want to make sure you’re happy with all your joinery before your build starts as often nib walls and other walls are created around the joinery designs, so if these are already built and then you change your mind about something in your joinery then you’ll find it expensive to have to change this. If you’re renovating an old house decide whether or not you want to change window locks or front door handles as this will impact budget as well as painting and preparation for painting. Does any of your internal door hardware need changing? If so, make sure you’ve selected what you want to use and that it will work with your existing doors. Not all handles can be retrofit on older style doors so you’ll want to just order one sample and check with your builder before placing your entire order. Make sure you’ve also decided what sort of handles you want on your kitchen/laundry/bathroom joinery. Or perhaps you don't want handles at all on the joinery (i.e. sharknose finger pull instead). If you do select handles, make sure you get one sample and check with your joiner that it will work with the joinery designs that have been prepared. Some handles require that special adjustments be made to joinery doors. This isn’t always possible on all finishes and also the work involved in routing some handles can result in an increase to your joinery spend. So just make sure you’ve selected all this and have the OK from your builder or joiner that the handles will work. Choosing paint isn’t always essential at the early stages of a build but if you are wanting to paint a dark room white or have special or complicated feature walls then these decisions will likely have a cost implication. So if possible have your paint colours selected so your builder can get an accurate quote from the painters. Flooring levels are a huge part of your early considerations when you’re renovating. Although a good builder will make sure that your flooring levels are consistent across your renovation, some won’t ask you about it (especially in budget renovations). In addition it’s not always possible to get flooring levels flush and compromises may need to be made. If you are trying to achieve a high end finish you will want to make sure your floor levels are flush throughout your entire home. However, this can’t always be achieved easily, especially if you’re on a budget, so you’ll need to know what flooring your using in each room and talk to your builder early on about whether or not there will be issues you need to compromise on. The photo below provides a good example of what I’m talking about. In this project I kept all the internal thresholds flush. We had laid engineered floor boards over the top of the original floor in the hallway, had tiles in bathrooms and had carpet in bedrooms. The entire house was completely flush. However, laying the new boards over the existing floors created an issue at the entrance (i.e. the tiny step up you can see in the photo below). This was a compromise I was willing to live with to get the flush thresholds in the rest of the house. If I had wanted to make it completely flush from the entrance all the way through the house I would have had to pull out this (existing federation) front door and replace with something new, remove the (existing federation) terrazzo step and install a new one of these as well. This would have been a huge extra expense and one that wasn’t worth it for the sake of the tiny step up to the boards. Also, I didn’t want to remove original features from the house, so compromised on this. The alternative would have been to rip out all the subfloors in the entire house and start over with floor levels, also hugely costly and time consuming. So the tiny step up was the compromise I was willing to make. Floor heights are a really important discussion to have with your builder as early as you can. 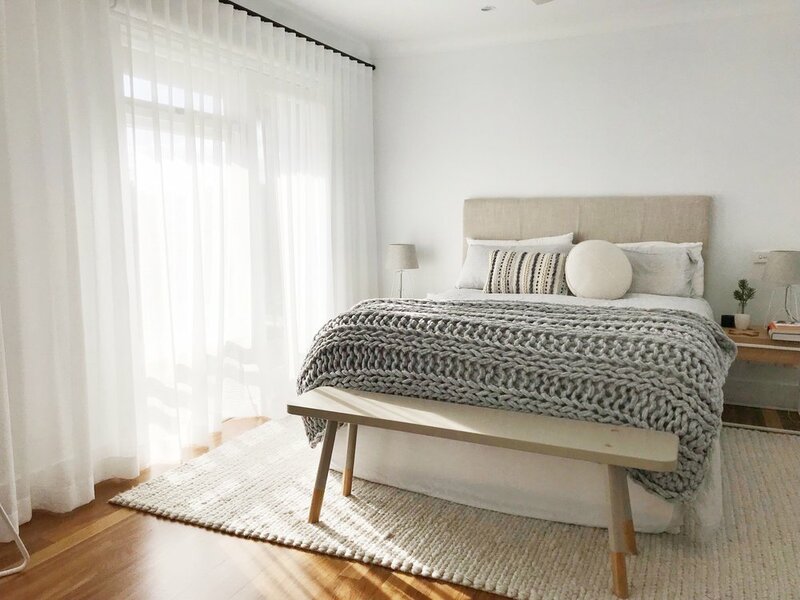 You’ll most likely find that you will need to make a number of decisions and compromises in relation to flooring and floor levels if you want to stick to budget and timeframes. There’s a number of issues to consider early on in relation to your tiles. Tiles are one of the finishes that can have long lead times so that’s the first issue. Make sure that the tiles you want to choose will be in stock (or have lead times you can cope with) and won’t hold your build up. You will also need to know exactly what tiles you are using prior to quoting if you want to get an accurate price from your builder (or tiler if you’re managing the trades yourself). Tilers not only quote based on the amount of tiling (i.e. square meterage) that they have to tile, but also on the types of tiles they will be working with. Mosaic tiles, for example, are generally more expensive to lay as they involve more difficult cuts and are time consuming to install, so they will likely charge you more to lay these. If you want to mitre tiles at the edges (which I recommend over using edging/angles - see my post with a bit more information about that here), you will find that costs more as well. Early tile choices are also important to your builder so that he/she can manage floor levels across the house, as discussed above. Builders will also want to be able to create appropriate falls in bathrooms - i.e. so water runs towards drains and not out the door - and often knowing the thickness and size of tiles he/she is going to be working with is important in ensuring this is all planned out correctly. Fixtures such as taps, basins, baths and sinks are also important to select early on. As mentioned above, the choice of these can impact joinery design. But also many fixtures can have 12-14 week lead times on them, especially if you want a special or custom finish. Many clients don’t realise that parts of the taps (the ‘in walls’ for shower mixers and handheld showers, for example) need to be roughed in prior to waterproofing - which is generally fairly early in the renovation process. So if you’re working with a 12-14 week lead time on a custom finish this will be one of the first things you’re going to want to order and have in place. If you end up ordering these too late you may find you can only get what’s in stock, which is generally just chrome finish. This may impact the whole end design of your house, so you’ll want to make sure this purchase is done really early. A well thought through lighting plan doesn't happen on the day the electrician turns up to provide a quote, nor does it involve your architect dropping in a random collection of down lights in every room on your plans. Lighting design is a whole design industry of its own but most clients don’t have the budget to hire a lighting designer. You will find that a number of specialty light stores will offer a lighting design consultation free of charge, in return for you purchasing from them. So this may be something worth considering if you’re using a company like that. Otherwise a good interior designer will give this consideration as part of their interiors scheme for your home. If you’re planning out lighting yourself you need to think about lighting from a number of angles - task lighting, mood lighting and functional lighting. Also - lighting and electrical can be VERY expensive to move once it's been roughed in and gyprocked over. You'll want to make sure you have every light switch, power point and light mapped out way before you start so they all get roughed in at the correct place. glass - e.g. do you want your glass double/tripled glazed as this will help reduce heat coming in during summer and warm air escaping in winter - there are cost implications with this of course! If you don’t know to ask about any of the items above you’ll likely get whatever is cheapest for the builder to install (unless you have an exceptional builder!) and you may be sorry when your home is finished and you can hear everything that is happening in the guest toilet! If you want to have underfloor heating in any area in your house - e.g. 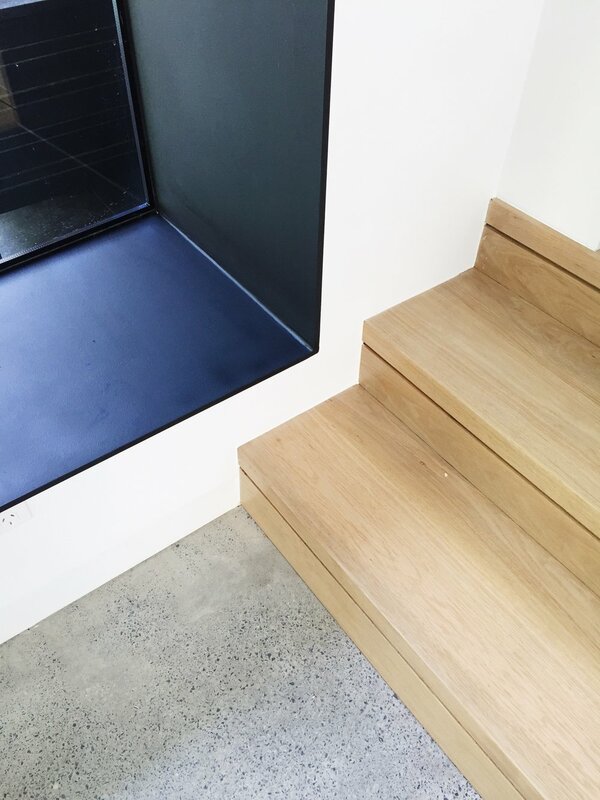 under polished concrete or in bathrooms - you’ll need to make sure this is planned well before construction commences as it affects floor levels, electrical requirements and more. Make sure to at least allow a budget for furniture early on in your renovation. There is nothing worse than creating a brand new house and having to move all your old, mis matched IKEA furniture back in as you’ve run out of money to buy anything nice to style the finished home with. For early planning the main an issue is again to leave enough budget to get your gardens looking up to scratch again after the renovation. Most clients can’t even imagine how badly damaged their gardens are likely to become during a large scale renovation. 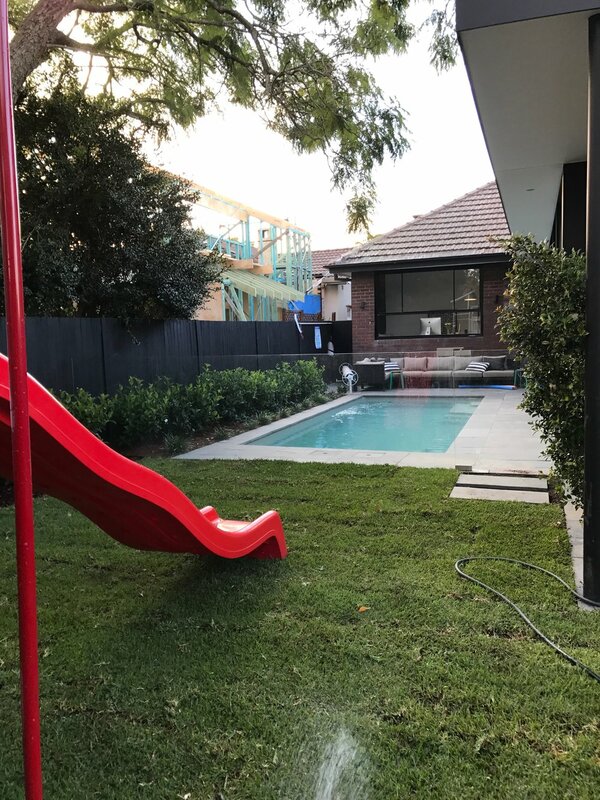 Perhaps this garden below from one of my renovations will give you a a bit of an idea! Builders just aren’t careful with gardens when they are working, as you can see. They store all their items and rubbish anywhere they can find a space - and you’ll find grass that was once perfectly healthy will die under such treatment. But with a bit of budget put asides believe it or not, this is what this home and garden turned out like in the end! The garden wasn’t super complicated but it was neat and tidy. Plus enough budget was saved for a bit of planting, some hard landscaping and some grassed areas. Overall if you take nothing else away from this article it’s that I really hope you organise and plan your renovation as carefully as possible BEFORE you start anything. The better prepared you are the more smoothly your renovation will run, the less mistakes will be made and the more money you will save! If you need help with your renovation then there’s a number of ways that I may be able to help. Book in a Reno on Track session or perhaps browse through my Reno Resources. You may also be interested in my upcoming masterclasses and workshops, in which case please sign up to the newsletter below to be the first notified when these are released. In the meantime - Happy Renovating!